This large roof loft conversion extension provided enough space for two bedrooms and a shower room. The design of loft conversion changed a bungalow into a good sized house. The side ‘hip’ roof was extended to create a gable end. This also had a traditional sussex barn end detail. A large rear box dormer was built to accommodate the shower room. A Velux window was positioned over the new staircase and now floods the new hallway in light. The position of the staircase was critical to the success of this project. A non load bearing wall was removed and a small amount of space was taken from the spare room to accommodate the new loft conversion staircase. 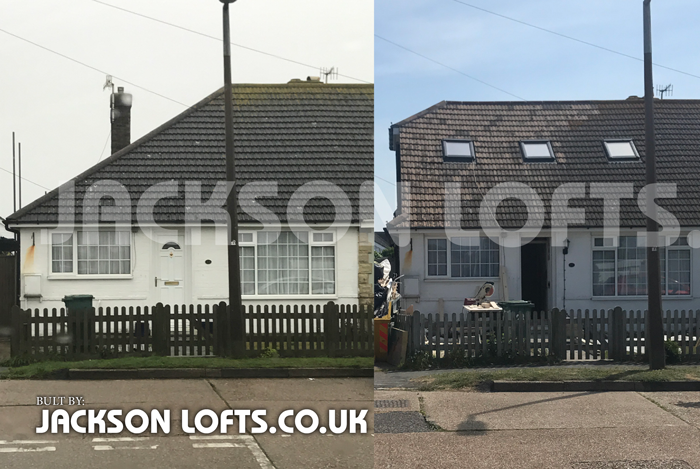 This entry was posted in Loft conversions and tagged 2 bedroom bungalow to 4 bedroom house, before and after view, bungalow loft conversion, SUSSEX LOFT CONVERSION, two bedrooms and a shower room. Bookmark the permalink.